For at least 16 years, Guarani communities have been disputing with their neighbours and the government of Misiones over the future of their shared land within the Yabotí Biosphere Reserve in north-eastern Argentina. On 16 April, in an unprecedented agreement never before seen in the country, the three Guarani communities approved a Multicultural Alliance that would see the 9,301 acres (3,764 hectares) of land designated as a protected nature reserve, the Emerald Green Corridor (Esmeraldas Corredor Verde), and managed for conservation. Under the final agreement, the title to the land will be held as Traditional Indigenous Lands, which under Argentine law means that it belongs to the Guarani communities and is ‘inalienable in perpetuity’ – probably the strongest legal protection of any sort available. The indigenous groups agreed to and strongly support a number of restrictions that will protect the biodiversity of the habitat. All parties decided that the area would be subject to a conservation management plan, drawn up by a WLT partner organisation. 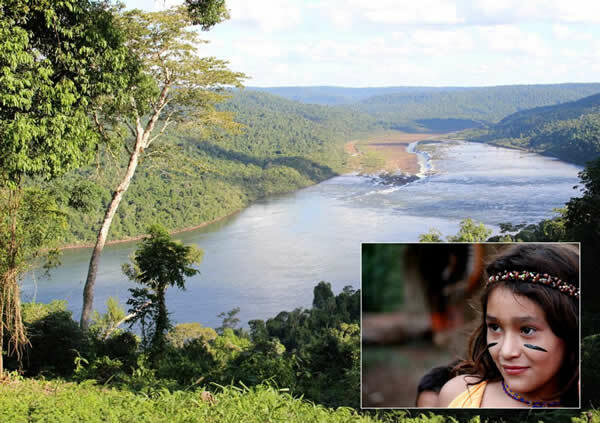 The Guarani representatives stated that this agreement respected their rights and traditional way of life, while also ensuring the future conservation of the rainforest ecosystem. 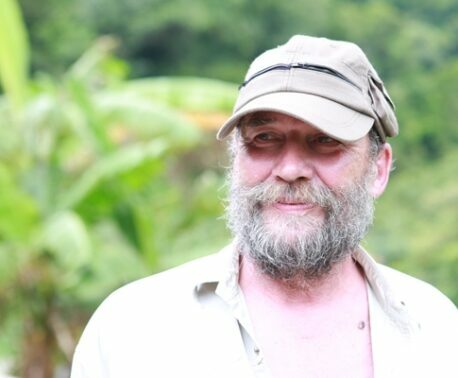 Former owners of the land, Moconá Forestal, also want to support and continue work to strengthen the Alliance, so that together we rehearse modes and innovative methodologies to defend the native forest as a source of strategic environmental services. Why is this land so important? Home to an array of endangered wildlife that is found nowhere else in the world, the Yabotí Biosphere Reserve protects the last remaining remnants of Atlantic Rainforest in Argentina – one of the most threatened habitats on Earth. Once stretching in a huge swathe through Brazil, Uruguay, Paraguay and Argentina, today the Atlantic Rainforest has been reduced to isolated fragments with only seven per cent of forest cover remaining. Despite the crucial role the reserve has in protecting this fragile habitat, much of the land within it is privately owned and so is still at risk from development to create new housing and roads, exploitation for its natural resources such as timbre, and destruction through forest clearance for tobacco and soya plantations. 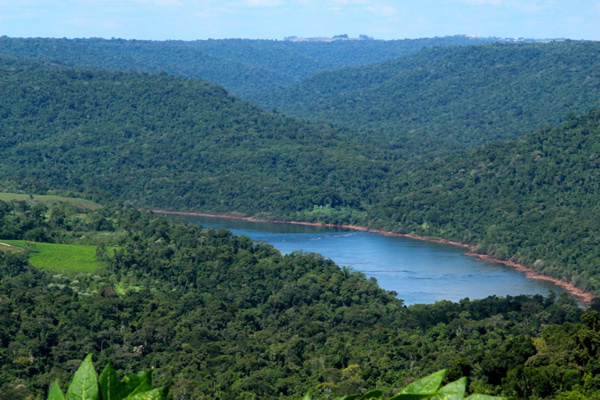 The 9,301 acre land, formerly owned by Moconá Forestal but has Guarani communities living on it, is part of an important wildlife corridor that links with Moconá Provincial Park and Turvo State Park in Brazil – that is next to the River Uruguay opposite Moconá Falls. 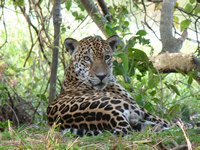 WLT aims to fund the purchase of more privately owned areas alongside it so that eventually the wildlife corridor will connect to the Esmeralda Provincial Park – creating a continuous protected area of over 100,000 acres (42,000 ha). By protecting wildlife corridors like this one, you enable animals to roam safely in search of food and breeding partners; this can increase their gene pool, decreasing conflict between people and animals, and help towards securing their continued survival. This is particularly important for far-ranging predators, like the Puma and Jaguar, which are known to live in Yabotí Biosphere Reserve. In 2006, WLT began working on a proposal to help our partner organisation to purchase the land from Moconá Forestal and designate the wildlife corridor as a protected nature reserve. Although in principle both Moconá Forestal and the Guarani communities agreed to this, how the land would be managed was a contentious debate between the two parties for years – leading to stalemate. 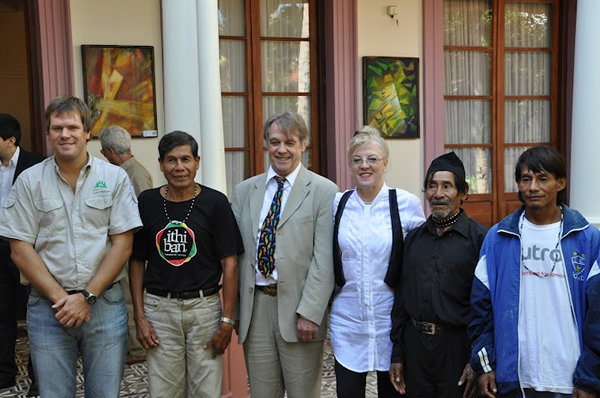 To ensure that dialogue remained open and constructive, John (WLT’s CEO) undertook several site visits to Misiones throughout 2010 and 2011, meeting with Guarani representatives, government officials from the Ministry of Environment of Misiones Province, and the CEO of Moconá Forestal, Nicolás Laharrague. Despite this, progress was slow and WLT feared that dialogue between the parties would collapse. 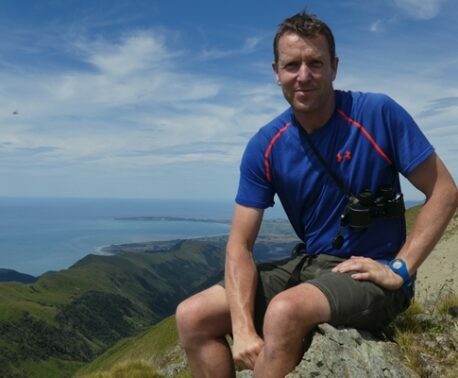 At the beginning of 2012, John decided that a completely new approach was needed and that it was vital to have someone on the ground who could oversee negotiations with all parties involved. Professional negotiator, Javier Jimenez based in Buenos Aires, was recommended by our partner organisation in Barcelona, Accionatura. Javier’s vast experience and skills working to up-hold indigenous rights quickly became apparent and he made significant progress over the first few weeks of the year. This resulted in a spectacular achievement, better than WLT could ever have anticipated. On Monday 16 April, the agreement was announced in the Governor’s Office in Posadas, the capital of Misiones Province, in a presentation that was made in front of 11 ministers of the government, with three Guarani Caciques (heads) speaking to emphasise its importance. 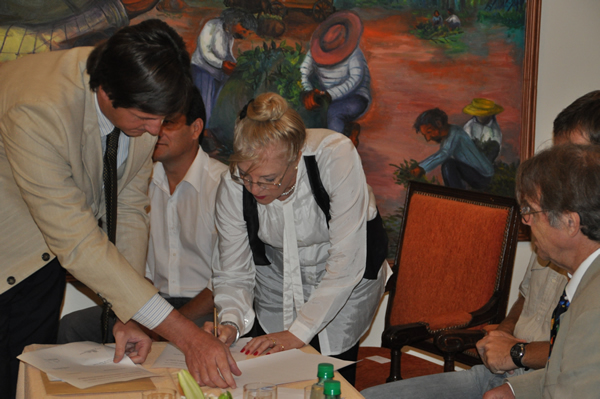 The parties to the final agreement were the Ministry of Environment of Misiones Province, the representatives of the Guarani communities, Nicholas Laharrague (CEO of Moconá Forestal), and Luis Castelli, president of La Fundación Naturaleza para el Futuro (FuNaFu) a local Argentinian non-governmental organisation nominated by WLT. At a lunch hosted by Viviana Rovira, the Minister of Environment, John was asked if WLT would be happy for the Provincial Government to take this project to the Rio +20 Conference to be held between 20 and 22 June, as an example of innovative methods of conserving biodiversity and solving problems. 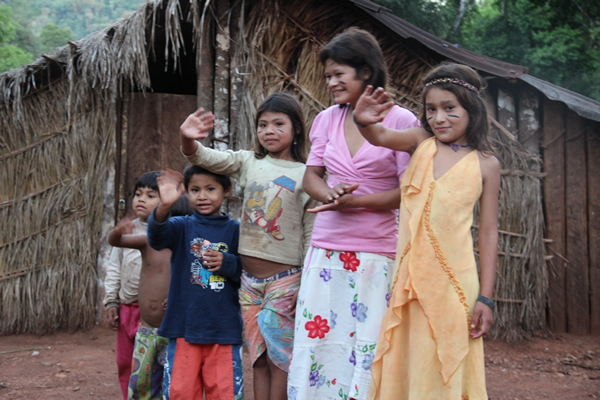 The day after signing the agreement, John visited one of the Guarani communities, where some of the children sang tradition songs in thanks and the cacique expressed his gratitude for the work of WLT in achieving the agreement. Now that this collaborative Multicultural Alliance is in place, we can begin conservation work within the Emerald Green Corridor thanks to a significant donation from the Bake Family Trust and funding from WLT corporate supporters Eurojersey, Calypso Soft Drinks, PricewaterhouseCoopers, Conoisseur Dry Cleaners and Treadz. Without their commitment and patient understanding of the complexities of this project, the continued conservation of this biodiversity-rich habitat would not be possible.